As part of the relationship between human and horse, it is important to understand your horse’s personality. 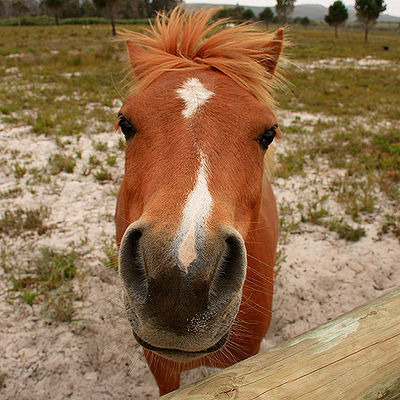 According to Yvonne Barteau, in an article for Equisearch, there are 4 basic horse personalities. The first personality is the social horse. Social horses love to be petted and fussed over. They play readily with other horses. These horses will readily accept people into their personal space and are relatively easy to train. They have fairly short attention spans. The second personality type is the fearful horse. These horses are guarded and cautious and tend to get panicky when confined in a small space. Fearful horses need time to adjust to new circumstances and may react strongly to stimulus. Their instinct in such situations is to run away. Once they are trained, these horses do their best to comply and have long attention spans. The aloof horse is the third personality type. Aloof horses tend to tune out all forms of stimuli. They are independent of both horses and people. The difficulty in training them is getting them to focus on the lessons. They are tolerant of invasions of their personal space. The fourth personality is the challenging horse. Challenging horses have a certain arrogance and need to be taught to be obedient. They may bully other horses and react in a confrontational manner when faced with stimuli. These horses are territorial regarding their personal space. Of course, many horses display a combination of two or more of these basic personality types. Some are more aggressive or more passive in their characteristics. When meeting a new horse, first observe the horse by itself. Then try to interact with him to get a feel for his reactions to your presence. Within a short amount of time, it should be obvious what personality type you are dealing with, and you can make training decisions based on your assessment. Social horses should be easy to handle, but one must be careful not to spoil them too much. Fearful horses should be trained slowly and with a lot of reassurance, by as few handlers as possible. Aloof horses need extra interaction and treats to keep them focused. Challenging horses need a firmer hand and should be handled by someone not easily intimidated.